The glory of shoal draft! We can beach and unbeach Ceres at will. Now Ceres is riding at a beautiful and protected anchorage that nobody else would want! 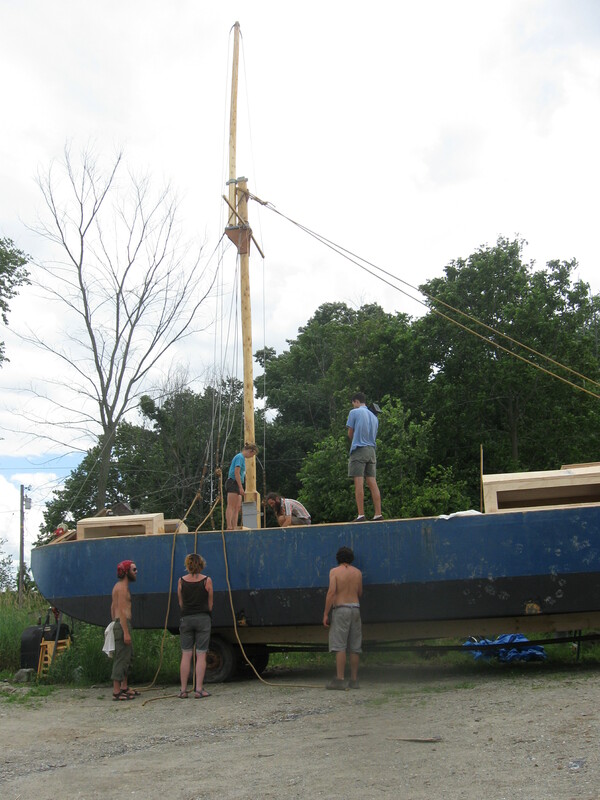 Too shallow and weedy for v-hull sailboats or propeller-driven craft. We are still on terra firma here. But hopefully not for too much longer. The list of tasks to get under heel is getting shorter. Yes, it’s true I had hoped to be in the water by now. I seem to recall myself stating we’d launch by the 4th of July on a few occasions. 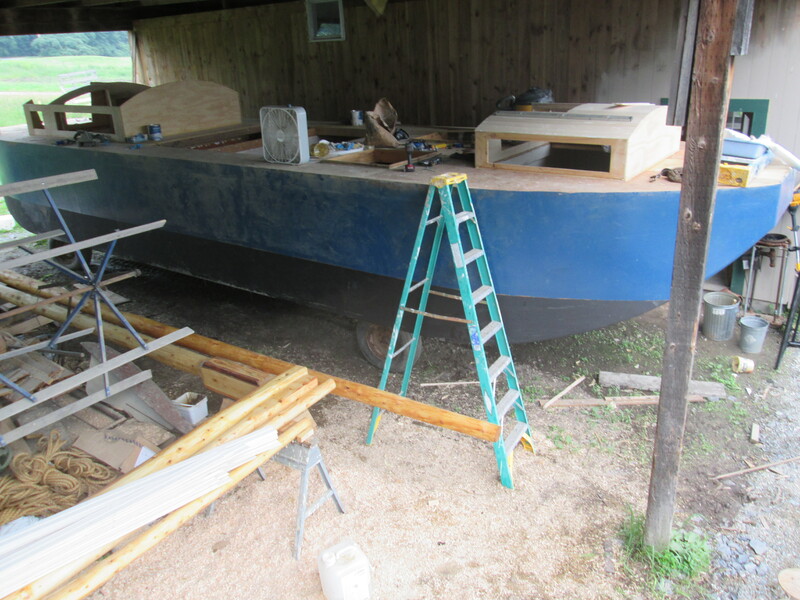 But here is Ceres, still in the barn, getting more paint and hatches and whatnot. Still, we will have gone from start to finish in four and a half months. That’s something. Ceres is turning out to be something too, a funny composite of native and foreign, old and new. She inhabits the present moment, while maintaining strong ties to the past and evoking what we hope will be our future. So, about that launch. Yes, it’s happening. The official celebration is Saturday July 27th at Ferrisburgh Town Beach, 2 to 5 p.m. You can go to our facebook page (https://www.facebook.com/VTSailFreight) to let us know you’re coming! We’ll have some light fare and music and maybe a short speech or two. Also swimming! Note that we are celebrating at a beach and not a deepwater marina or harbor. Witness the glory of the shoal-draft vessel! We will draw only about a foot of water empty so it’s no problem for us to cohabit with swimmers and even waders. 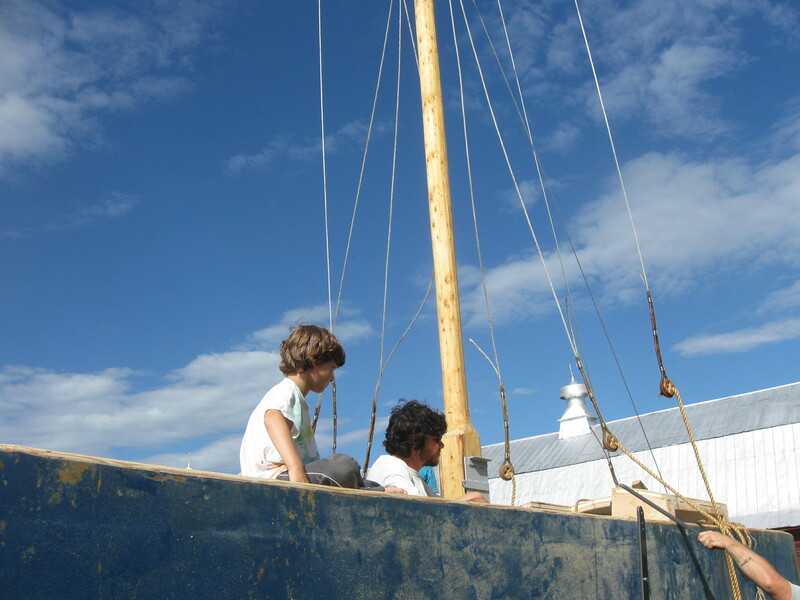 Here at the farm, which is also of course the build site, we raised the mast late last week A glory to behold! The winch system worked just as designed, safely raising and lowering our 36 foot mast in just a few minutes! And while there is still a whole lot to say, I have to keep busy wearing that punchlist down to nothing. Count on one more post though before we launch! we are painting interior hold surfaces to seal them. All joints are also filleted with epoxy paste. Long days here at the farm where endurance is the limiting factor, not daylight. We are now finishing out the interior compartments of Ceres. 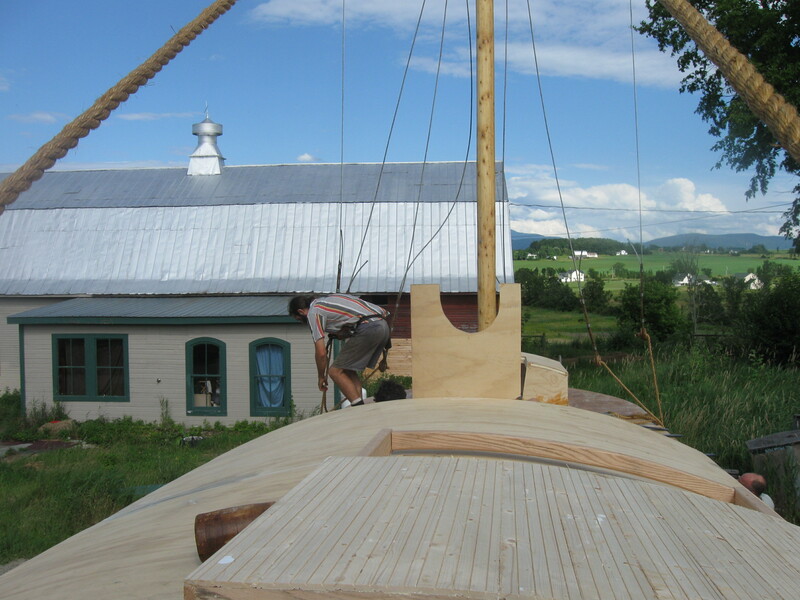 Sailmaker Matthew Wright is busy stitching, Woodworker Brian Goblik is making blocks, and Carrie and Will are planning to return to raise the mast in about 2 weeks. By that time we think we’ll have most of the finish work done. 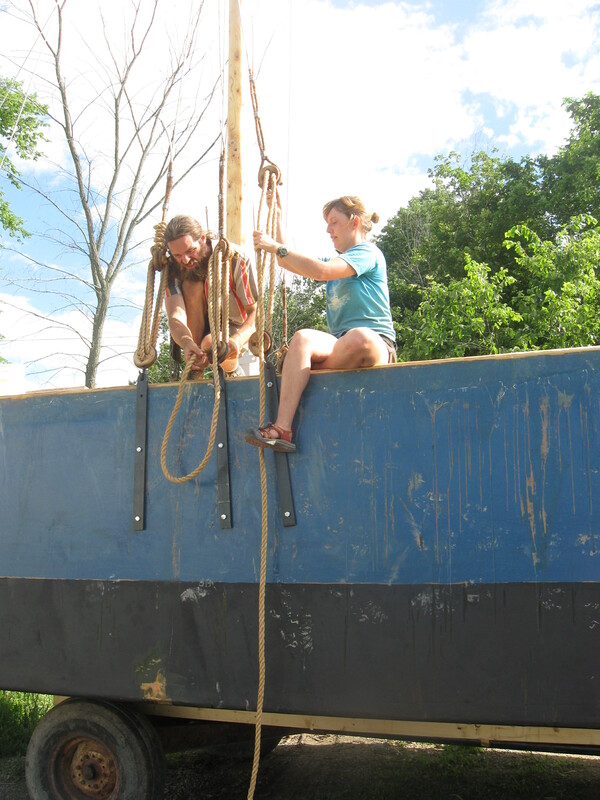 Normally, rigging would be done in a boatyard or marina setting, but since our “boatyard” is a farm and our rig is collapsible, we will probably try to complete as much as possible of the rig here on Burroughs Farm Road before we hook Ceres to the tractor and tow her to the lake. 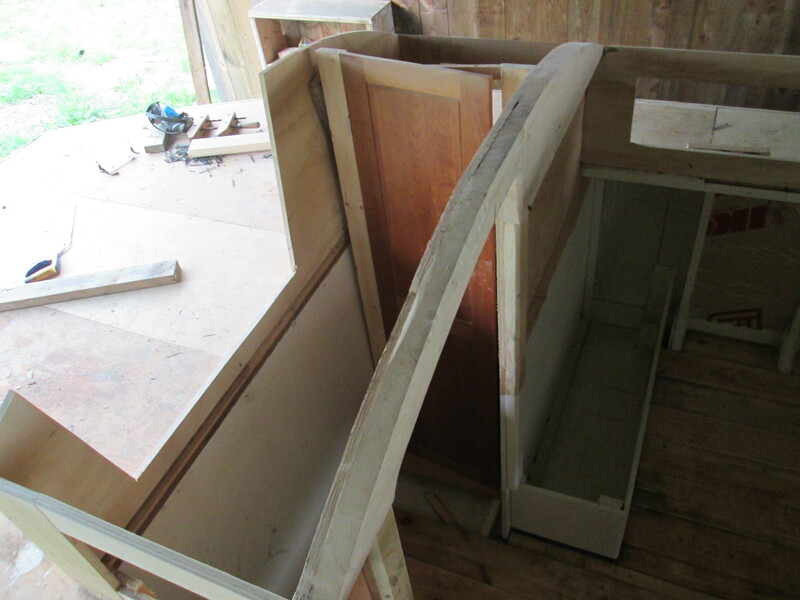 This afternoon I framed out the forecastle deckhouse and berths. Fairly spacious berths side-to-side, but let’s just say we will have to learn to curb any urge to sit bolt upright in bed. The aft crew compartment is much more spacious, 6’4″ of headroom. The head (bathroom) even has a tile floor, made up of leftover tiles from a job I did in the house a few years ago. The accent tiles match Ceres’s colors! Likely that most crew time belowdecks will be spent in the aft cabin with the focsle reserved to sleep only. 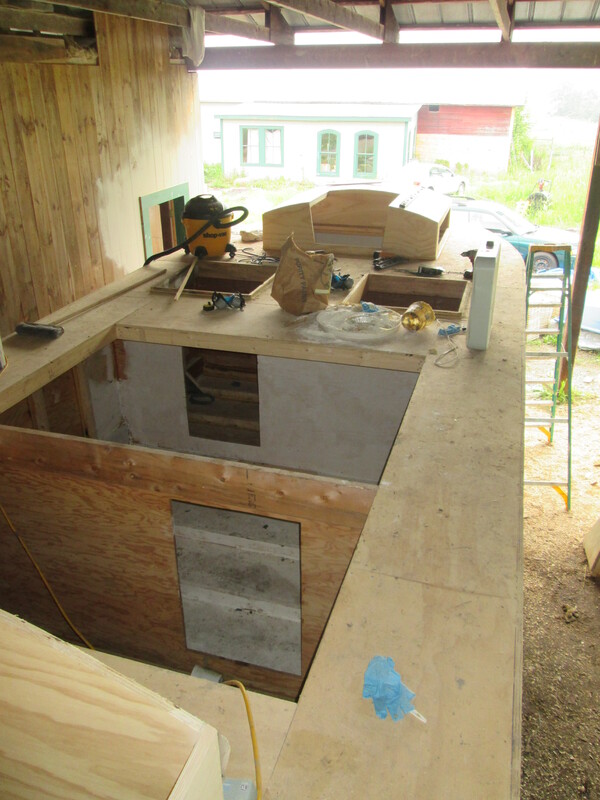 Another feature of the aft cabin is a trestle table at which we hope to seat up to five in the cabin, but which can convert into an on-deck configuration about 8 feet long and 3 feet wide, at which we can easily seat ten or twelve for meals on deck. Since our deck is exactly 10 feet wide this table can be easily covered by a 10′ x 10′ canopy tent. Jordan and I attended New Amsterdam Farmers Market in NYC last weekend, building our mailing list (which you can also join by clicking here) and networking with the food scene down where the river meets the sea. It’s all very encouraging. I spent the next three days bringing the project’s good friends Geoff Uttmark and up to date and pondering our next moves, plus visiting with Roberta Weisbrod of the and Shino Tanikawa of the . 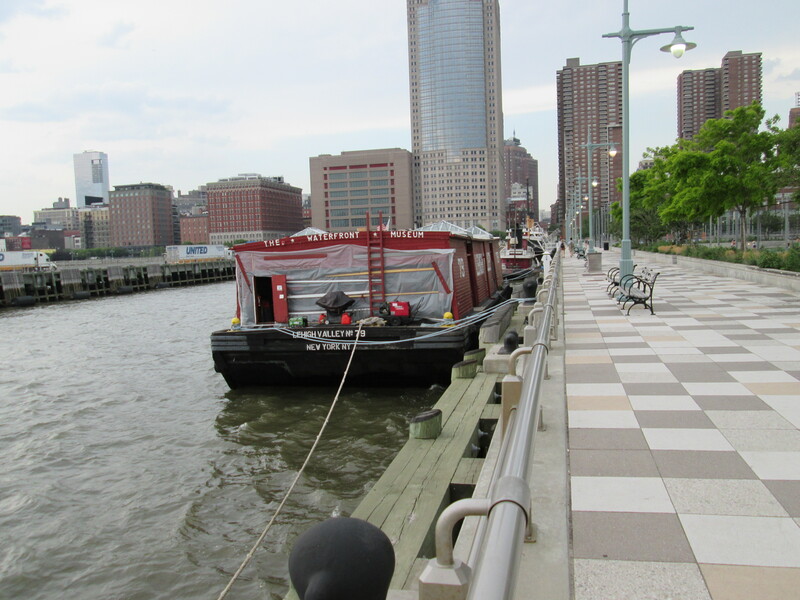 I also toured several potential docking locations, walking up and down along the Hudson and the East River. It was plenty warm there too, and no surprise I guess, since it is summer in the city, which makes for a hot town. And as for the condition of the back of my neck, well, best not to go there. But I feel that I accomplished a lot, including mastering the route of the F train. I wore my huge-brimmed straw hat constantly, making one NYC worker working bareheaded in the hot sun outside a subway entrance vocally envious. My hat is not so dapper as the narrow brim straw hats favored by hipsters, but it does make some really sweet shade. On the way home I visited the Beacon Sloop Club, and went for an evening sail in light airs on the sloop Woody Guthrie, with Captain Steve at the helm. Then the next morning I presented the project to the Mechanicville Rotary Club. Mechanicville is a small town to the north of Albany and Troy, whose historic prosperity was owed to the Champlain Canal. 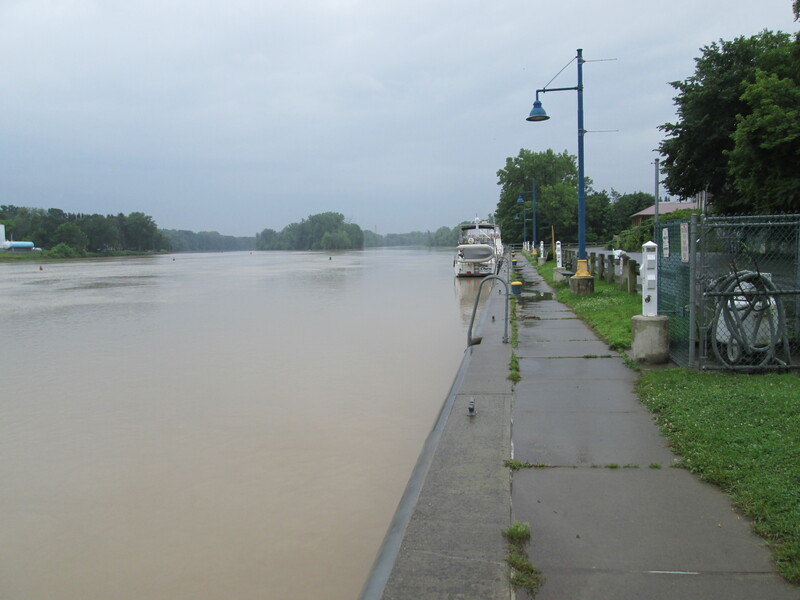 Mechanicville is still eager to make the most of its connection to this waterway, and is an ideal stopping place for our project. On pier 26, looking inland. We might tie up here when we visit this fall. Atlantic Basin in the foreground, with the Statue of Liberty and an excursion schooner in the distance. 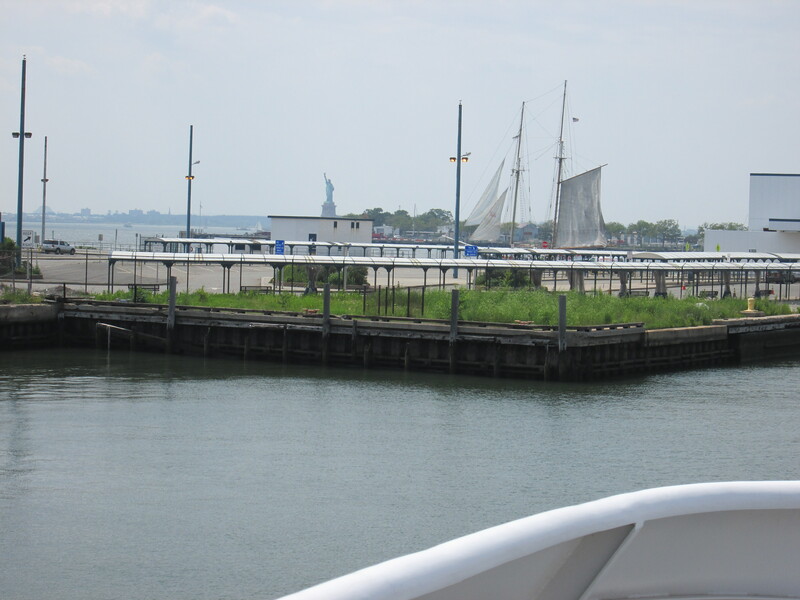 Atlantic Basin is a very sheltered docking location in Brooklyn that might be made available to us. 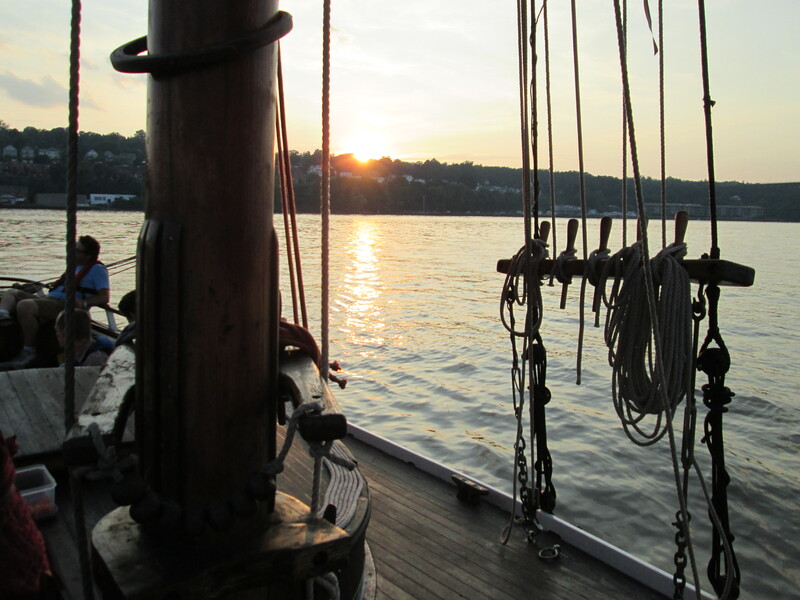 Out on the Hudson on the Woody Guthrie. I was in such a hurry not to miss the boat that I left my accordion in the car. Pity that. The Hudson is much smaller in Mechanicville, a little town with a beautiful waterfront.